When Toyota launched its Etios models towards the end of last year, speculations were high on the feasibility of it to ever get into the semi urban rural areas of India. As the price tags on these cars were high, so it was stuck to the urban areas only. But now the firm has decided to enter the unexplored areas of India with two of its best Etios variants. The Toyota Etios Sedan and Toyota Etios Liva Hatchback are getting prepared to hit the budget car segment of the Indian automobile industry very soon by the company. Both the variants has been thoughtfully designed and developed with excellent reliability and quality for the new zones of the market. Right now, Toyota Etios Sedan comes in more than one variant. The 1.5 liter 2NR-FE, 16V DOHC, 4 Cylinder petrol engine gives 90 PS at 5600 rpm with a peak torque of 132 Nm at 3000 rpm. Equipped with EFI (electronic fuel injection) and double camshaft and every cylinder having four valves, this engine ensures proliferated power and torque with an excellent volume of fuel efficiency. The standard pistons are coated with molybdenum in the petrol sedan. The 8V, 1364cc, SOHC diesel engine produces a good volume of 68 PS power at 3800 rpm where it has a max torque of 170 Nm at 1800-2400 rpm. The existing models of Toyota Etios Liva Hatchback also has both petrol and diesel options. The 16V, 4-Cylinder, 3NR-FE, 1197cc DOHC petrol engine of Liva hatchback churns out 80 PS with a max torque of 104 Nm. The new hatchback will have the same powers in terms of torque and PS but it will be a bit cheaper than the current models. The 1364cc diesel engine of Toyota Etios Liva Diesel gives 68 PS of power and generates a peak torque of 170 Nm at 1800 to 2400 rpm. 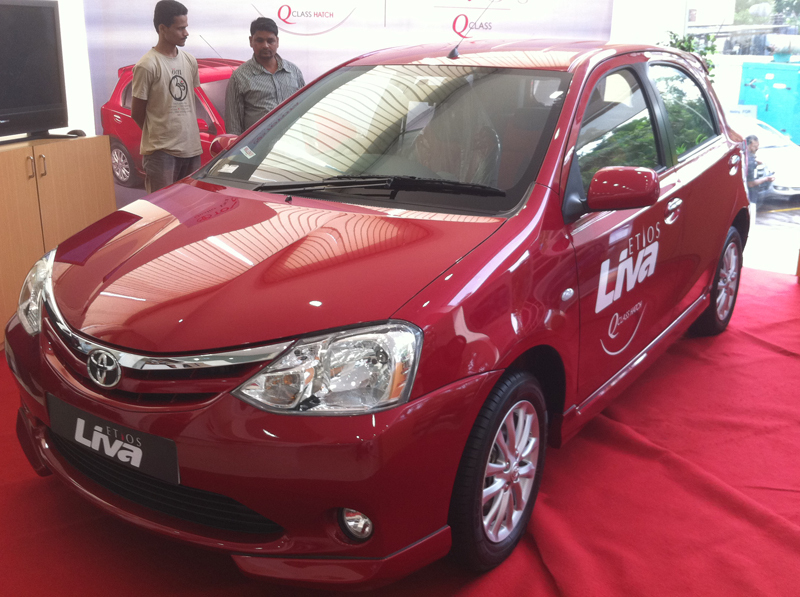 The low rpm of both kinds of engines in Liva makes it the best for the city roads of India. The five-speed transmission gives an optimum performance both in the city as well as on the highways. Before pushing these cars into new zones, like the towns of Punjab, Asansol and Tripura, the firm intends to open up more dealerships and service stations in the majority of the small towns of India. That will ensure the firm to offer a good after sale service of the vehicles locally for their customers. Right now the twins are an excellent brand with its sales in the automobile market of India but it can do much better in terms of sales if it is made available in the small but rich towns of India, namely Bhubaneswar, Guwhati, Shillong, Jamshedpur, Indore, Raipur etc. The potential of sales is unimaginably high keeping in mind that ten years ago people in the mining sectors of Jharkhand bought Pajero and Land Rovers from metropolitan cities and drove them back home for multi luxurious purposes.